Digest Yee Sang 101: Why Do We Toss It And What Does It Symbolise? Yee Sang 101: Why Do We Toss It And What Does It Symbolise? We find out how the yee sang came about and why it is a dish that truly beholds more than it appears. Chinese New Year wouldn’t be complete without a few key things – angpaus, resplendent reunion dinners, and of course, yee sang. Yee sang has become such an integral part of the Lunar New Year that every year, restaurants across town are getting increasingly creative with their offerings. But what is the symbolism behind this tossing of a bunch of mixed vegetables laced with seafood? More importantly, who came up with it and what has it got to do with Chinese traditions? According to Chef Terrence Foong, the executive Chinese chef of Lai Ching Yuen at Grand Millennium Hotel KL, it all started in Melaka, the port where many of the Chinese came into Malaya from back in the day. That explains why it is a tradition practiced mainly by the Chinese in the Southern states (predominantly Selangor, Negeri Sembilan, Melaka, Johor and our neighbour Singapore); those in Penang and Kedah would have hardly heard of it. More interestingly, it started out as a poor man’s food. Times were hard back then so instead of having the 8-course dinners we’re accustomed to now, the Chinese made do with vegetables that were easily attainable from their own garden, like leek, carrot, turnip and cucumber. These vegetables are chopped up and dressed in equally simple dressings like sweet plum sauce, vegetable oil, salt and pepper to flavour it. 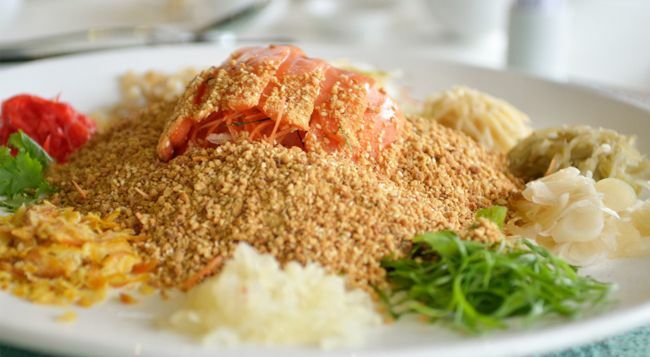 To add a bit of ‘yu’ (bounty or prosperity in Chinese) to the simple meal, they added fish (also called ‘yu’) hence the appearance of salmon or some form of seafood in the mix. Thing to note is that the fish has to be raw, or 'sang' in Chinese, because 'sang' also means to grow and prosper. The chosen vegetables weren’t simply picked on a whim. Seven symbolic vegetables can always be found in any yee sang platter. Read on to find out why each made it to the special mix and why the yee sang is a dish that truly beholds more than it appears. In Chinese, leek is called ‘qiu tao’ which also happens to sound like the Chinese term for ‘ideas’. It is hence eaten with the hope that one will get more ideas to grow and prosper whether in business, relationships or life. Cucumber, or ‘ja kua’ in Chinese, shares the same pronounciation as the word for ‘returns’. It is thus symbolic of having many happy returns in all your ventures. As you’ll have guessed by now, the Chinese term for papaya, ‘mog kua’, also sounds like something else – in this case, the best returns. Eat it and you’ll not only have the best returns in all your endeavours, you’ll also be the best. Ginger has always been well-favoured in Chinese cuisine, for its healing and anti-bacterial purposes. Because yee sang is a raw vegetable salad eaten with raw fish, the ginger is tossed in to kill bacteria and freshen up the palate. Like its white counterpart, red ginger also serves to kill bacteria and get rid of the fishy smell of raw fish while adding a nice splash of colour to the mix. With its bright orange colour resemblant of gold, carrots signify mountains of treasure that one hopes to have in one’s household. To fatten up the whole salad and make it substantial enough to fill many tummies at a go, radish makes up the biggest part of the yee sang because it is one of the cheapest and most easily attainable root vegetable. Turnip is also a popular replacement. On top of the vegetables, extra ingredients are often sprinkled on top before the tossing. These crackers are symbolic of the gold bars and taels from the olden days, thanks to their golden brown colour. Their sprinkling is likened to having gold spilling all over the ground so you’ll always have money in your home. The chopped peanuts not only add a nice crunch and nutty flavour to the yee sang, you are essentially being blessed with many children and a healthy future generation with it, a descendent line that grows and spread far and wide like peanut roots. Yee sang has to be sweet, so your year ahead boasts nothing but sweetness. The most popular sauce is plum sauce but we’ve seen many renditions in recent years, from apple to sweet walnut sauce. Vegetable oil represents liquid gold pouring over your life and affairs so not an area is missed from being covered in auspiciousness and prosperity. These two are sprinkled as means to invite more wealth to come by. The 5 spice powder also represents the 5 branches of happiness that the Chinese believes in – kindness, wealth, health, family and happy ending no matter where you turn. On top of adding zest to the raw fish, spritzing lime juice, ‘kat zhai’ in Chinese, is also symbolic of having a endless luck coming your way (‘tai kat tai lei’). Most restaurants will take care of the ingredients for you so all you need to do on your end is to make sure you toss it high and make as big a mess as you possibly can. The higher you toss, the higher your life and social standard will improve and the bigger a mess you make symbolises the bigger the grounds all these well wishes will cover in your life. Now toss away and have a prosperous Chinese New Year everyone! Yee sang isn't the only Chinese New Year staple with meaning, these 8 snacks are equally symbolic.